Devendra Jhajharia, Padma Shri, Arjun Awardi, the First Indian Paralympian who won 2 Gold Medals and set world record at Paralympics. He was born on 10th June 1981 in Churu district, Rajasthan. When he was just 8 years old, he met with an accident. While climbing tree, accidentally touched live cable of 11000 volt. He lost an arm in that accident. The accident left the 8 years old kid and his parents in depression. Devendra thought he would never be able to play with his friends again. He got insecure that his friends will isolate him because now he was weak. But his mother pushed him out of the house to play with other childrens. She wanted him to feel equal to other childrens. With time, the para-athlete got really interested in sports. He started practicing Javelin Throw with a hand made wooden Javelin in his fields. When he was in class 10th, he started formal coaching in Javelin. He was spotted while playing in school by Dronacharya Awardee Coach R.D Singh. And after that R.D. Singh trained him. In 2002, Devendra got selected to represent India for the first time. The same year he won gold medal in the 8th FESPIC Games in South Korea. 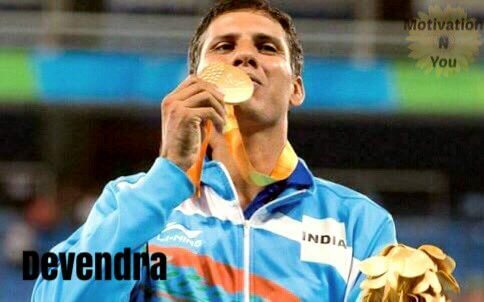 In 2004, he was the flag bearer of Indian contingent in Athens Paralympics and also won gold medal in same event. He also became First Indian to break world record. He set new world record with a distance of 62.15 m. Devendra received Arjun Award in the same year. In 2008 and 2012, there was no Javelin Throw in Paralympics. And many people suggested him to quit Javelin because after long gap, he won’t be able to reach the same level again. But despite of all criticism he waited for 12 years to participate in Paralympics. He kept himself motivated and worked hard. Devendra Jhajharia got awarded with Padma Shri by Government of India in 2012. With this he became first Paralympian to receive this award. In 2013, he won Gold Medal in F46 javelin throw at IPC Athletics World Championship in Lyon, France. In 2014, he won Silver in Asian Para Games in South Korea. He again claimed Silver Medal in 2015 IPC Athletics World Championship in Doha. Devendra was awarded with FCCI Para- sportsperson of the year in 2014. When it was announced that Javelin was back in Rio Paralympics in 2016. He challenged everyone that now he will show that what he could do. The gold Medalist proved everybody wrong by winning a Gold Medal and setting world record of 63.97 Meteres in 2016 Summer Paralympics in Rio De Janerio. He also won gold medal in IPC Athletics Asia – Oceania Championship in Dubai in 2016. In 2017, he received Rajiv Gandhi Khel Ratna award by Government of India. Devendra never leaves his Javelin in store. He always keep that in his room so that he can see his target 24 hours a day. Devendra did not get distracted by other things in his life. He always kept his mind on his target. He did not let his physical disability disable his mind.